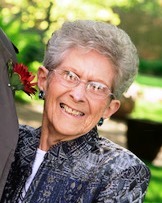 Anna Lee Byram Leach, 87 of Danville, went to heaven on April 4, 2018. A life-long resident of Hendricks County, she was born in Montclair, Indiana, to Edgar and Amy Woodrum Byram on August 24, 1930. She married the love of her life, Paul Leach, Jr. on December 7, 1946, a true love lasting more than 71 years. Anna was known for her beautiful smile, her love of the Lord, and her love for her family. Anna was an avid baseball fan, she loved watching I U Basketball and the Indianapolis Colts Football. She was very active in the church where she sang in the choir and was a member of several women’s groups throughout the years. Survivors include her husband, Paul of Danville; sons, Mike (Rita) Leach of Mooresville, Rex (Sandy) Leach, Doug (Jan) Leach, Craig (Theresa) Leach, all of Danville; daughter, Diana Jo (Jim) Switzer of Avon; 13 grandchildren, 17 great grandchildren, 1 great-great grandchild; brothers, Paul (Betty) Byram and John (Avis) Byram, both of Brownsburg. Her parents and sisters, Katherine Graves, Norma Griggs, Judy Rogers and Shirley Moody, preceded her in death. A memorial service will be held at 3:00 pm on Saturday, April 14, 2018 in the Danville Christian Church with visitation from 11:00 am until the service in the church. In lieu of flowers, contributions may be made to the Danville Public Library 101 S Indiana St Danville, IN 46122. Baker Funeral Home, Danville, is in charge of the arrangements.